Home Technology Technology - Player Transport Ice and Fire: Dragons in a whole new light! Ice and Fire: Dragons in a whole new light! Mod 1.13/1.12.2/1.11.2 – Dragons in a whole new light! Fire Dragon burning -- A fire dragon burns down what his rider commands him to. Baby Ice Dragon taking a ride -- A dragon owner taking their hatchling for a ride. Dragon versus player -- One player uses a dragon to try and burn down another player. Fire Dragon territory -- A fire dragon burns down prey that wandered too close to it. Ice Dragon Hunting -- An ice dragon takes a dive to hunt for squid. Fire Dragon's Glacier -- A fire dragon hovers before a glacier, a new biome added in Ice and Fire. Subservience of the dragon -- A player and a dragon share a bond and cooperate together. Young, but frightening -- A tamed dragon can quickly grow to be a monster. Snowy Village -- Snow villagers reside in their native glacier biome. They will trade players rare items for sapphires. Desolation left by the Ice Dragon -- An Ice Dragon's home: frozen stone remnants of a structure. Silver armor -- Two players in silver armor show off their dragon-covered shields. Fire Dragon takeoff -- A fire dragon hovers, as it is about to start to fly. This is a simple tutorial that will helps you to install Ice and Fire: Dragons in a whole new light! Mod for Minecraft 1.13, 1.12.2 and others version successfully! Download the Ice and Fire: Dragons in a whole new light! Mod below or from anywhere, make sure the mod is compatible with the version of Forge installed. 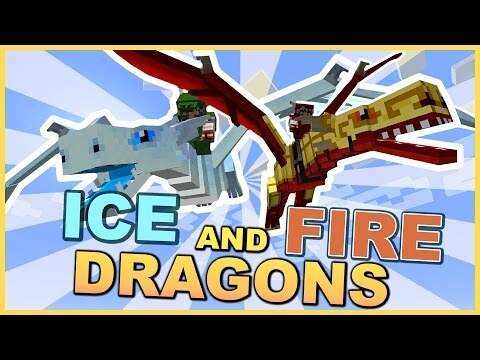 Place Ice and Fire: Dragons in a whole new light! into your Mods folder. If you don’t have one, create it now. Ice and Fire: Dragons in a whole new light! is created by alex1the1666, the mod was created on Apr 1, 2017 and the last update took place on Jan 16, 2019, so far is a total of 1,616,975 downloads. If you are interested in more information about Ice and Fire: Dragons in a whole new light! Mod, please go to CurseForge[link]. The Ice and Fire: Dragons in a whole new light! Mod download links from below are available for Minecraft's most popular versions so far, for others version (likes as 1.12.1 / 1.11.1 / 1.10.1 / 1.9.2 / 1.8.8 / 1.8.4 / 1.7.2 / 1.6.4 / 1.6.2 / 1.5.2 / 1.4.7) please visit the official website above! We do not host any Ice and Fire: Dragons in a whole new light! files on our website. We do not modify or edit the Ice and Fire: Dragons in a whole new light! in any way. If you have any problem with Ice and Fire: Dragons in a whole new light! Mod, please leave a comment below and we will help you as soon we can.